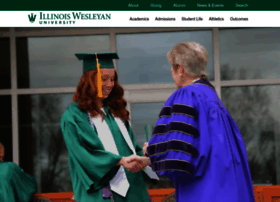 Founded in 1850, Illinois Wesleyan is a nationally recognized, highly selective liberal arts university. The University is exclusively undergraduate and enrolls approximately 1,700 students from across the nation and around the globe. Illinois Wesleyan prides itself on producing graduates who are well-rounded, broadly educated individuals with a spirit of inquiry who can successfully adapt to the demands of a rapidly changing, complex world.